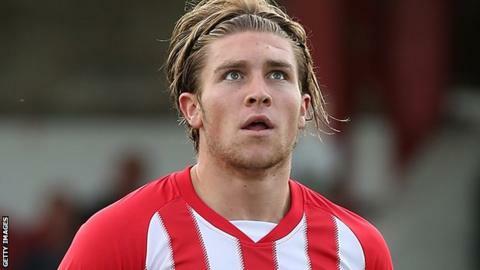 Josh Windass scored twice in a minute for Accrington Stanley in a comfortable win over Exeter City. Windass turned home Piero Mingoia's cross for his first in the 33rd minute before a mistake by goalkeeper Bobby Olejnik allowed him to steal the ball and fire home moments later. Mingoia drilled in a third and Billy Kee made it 4-0 from Matt Crooks' pass. Lee Holmes claimed Exeter's first and substitute Joel Grant also netted, but the visitors were already well beaten. Match ends, Accrington Stanley 4, Exeter City 2. Second Half ends, Accrington Stanley 4, Exeter City 2. Foul by Clinton Morrison (Exeter City). Dean Winnard (Accrington Stanley) wins a free kick in the attacking half. Goal! Accrington Stanley 4, Exeter City 2. Joel Grant (Exeter City) left footed shot from the centre of the box to the top left corner. Assisted by Manny Oyeleke. Clinton Morrison (Exeter City) wins a free kick in the attacking half. Corner, Exeter City. Conceded by Adam Buxton. Attempt saved. Matty Pearson (Accrington Stanley) right footed shot from outside the box is saved in the bottom left corner. Attempt blocked. David Noble (Exeter City) right footed shot from outside the box is blocked. Goal! Accrington Stanley 4, Exeter City 1. Tom Nichols (Exeter City) right footed shot from the centre of the box to the centre of the goal. Assisted by Clinton Morrison. Attempt saved. Tom Nichols (Exeter City) right footed shot from outside the box is saved in the bottom right corner. Foul by Tom Davies (Accrington Stanley). Substitution, Accrington Stanley. Antony Barry replaces Seamus Conneely. Substitution, Accrington Stanley. Andrew Proctor replaces Matt Crooks. Attempt saved. Christian Ribeiro (Exeter City) right footed shot from outside the box is saved in the top right corner. Attempt missed. Manny Oyeleke (Exeter City) right footed shot from outside the box is close, but misses to the right. Foul by Adam Buxton (Accrington Stanley). Substitution, Exeter City. Joel Grant replaces David Wheeler. Goal! Accrington Stanley 4, Exeter City 0. Billy Kee (Accrington Stanley) right footed shot from the centre of the box to the bottom right corner. Assisted by Matt Crooks. Goal! Accrington Stanley 3, Exeter City 0. Piero Mingoia (Accrington Stanley) right footed shot from the right side of the box to the bottom left corner. Assisted by Billy Kee. Attempt blocked. Josh Windass (Accrington Stanley) right footed shot from outside the box is blocked. Troy Brown (Exeter City) is shown the yellow card for a bad foul. Josh Windass (Accrington Stanley) wins a free kick in the defensive half. Attempt missed. Tom Nichols (Exeter City) right footed shot from the centre of the box is close, but misses to the left following a set piece situation.